Wellington is the capital of New Zealand. The city is named after Arthur Wellesley, the first duke of Wellington who defeated Napoleon Bonaparte in the Battle of Waterloo. 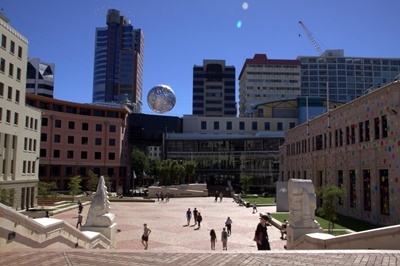 Wellington is the home of Parliament and all the government offices of New Zealand, which is the reason why it is also considered as the political center of New Zealand. It is considered as a good place to live in. It is a compact city easily navigated by foot; it has a dynamic atmosphere with a warm explosion of culture, creativity, and events. Wellington has sunshine at an average of 2,000 hours throughout the year. During the winter months, the city gets a cool blast from the south that makes it seem colder than it actually is inland. The city receives a temperate marine climate, with windy and sea breezes occasionally happen in summer. Summers can be hot so you do not forget your sunscreen and winters can be a bit cold so a waterproof or windproof jacket can be such a big help. In addition to being the capital, not, Wellington is also a culinary capital with more than 300 cafés and restaurants found throughout the city. You can also choose from a variety of delicacies that ranges from American to Asian to Middle Eastern among many others. All throughout Wellington, the treasure trove of food can be found offering the finest food, wine, and coffee. There are many activities that you can engage in while in Wellington. The city is known for stunning views, a rich collection of arts and culture, and a wonderful downtown area that you will never run out of ideas of what you can do while in Wellington. If you wish to explore the history and heritage of Wellington, you can find a number of establishments to visit. You can take a free tour of Parliament and visit some of the old buildings and government offices in Thorndon like The National Library Gallery and the Old St. Paul’s Cathedral. You can also hike through the major walkways in Wellington. The experience of viewing the scenic places and exploring the compact city by foot is exhilarating. There are many things that you can do that include visiting nature parks, museums, cafés and restaurants. You can also have lots of fun doing family activities and hiking while enjoying the different city sights. 1. Nature. Wellington is a city that is rich in breathtaking nature spots. Its closeness to nature is undeniably great for such an urban city. a. The Karori Sanctuary. A conservation facility that is home to New Zealand’s endangered wildlife. b.	Staglands Wildlife Reserve & Café. A unique reserve and café that is located in Akatarawa Valley where you can interact with native and exotic animals and enjoy various activities like swimming and picnic. c.	Kapiti Island. An island that is the home of the most endangered and rare birds in New Zealand. You also get to experience an interpretation of the local flora and fauna and the local history of the area through its local guides. 2. Arts and Culture. The richness of New Zealand’s culture can also be experienced by visiting some of the popular attractions and museums in Wellington. a. Museum of the New Zealand Te Papa Tongarewa. The bold and innovative national museum which celebrates the geology and national environment as well as the ethnicity of the locals. b.	Pataka Museum. A museum that showcase the best contemporary Maori, Pacific Island, and New Zealand art. c.	The Wellington Writer’s Walk. Included in Wellington’s major walkways, the Writer’s walk features 15 text sculptures in Wellington’s harbor. 3. National Heritage. Being New Zealand’s political capital, Wellington houses many historical and political buildings that are worth visiting. a. Parliament. A historic complex located at the historic village of Thorndon. b. The National Library of New Zealand. New Zealand’s leading cultural and information center located across the Parliament. c.	Old St. Paul’s Cathedral. A consecrated sanctuary that is a living proof of New Zealand’s greatest heritage battles.